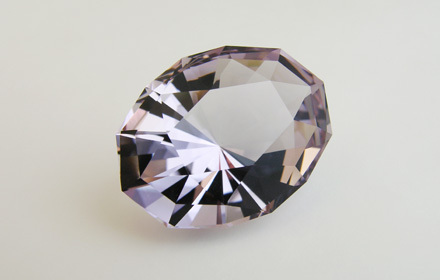 Weight: 32.00 ct; size: 25.25 | 19.25 | 14.20 mm; shape: oval; colour: light bluish violet; very slightly greyish; clarity: eye clean; cut: very good; treatment: none. Very clean specimen; design ‘Beginner Barion Oval a.k.a. Quake311’ by Michiko Huynh, very good cut by Tan Pen.